Geek's Guide to Britain The European Route of Industrial Heritage marks New Lanark as an anchor point in the global development of textiles and architecture, and so it is. Nestled in the Clyde Valley the village owes its existence to the falls that were harnessed to refine raw cotton sent in from the colonies: a picture-postcard image from a time when Britain was the factory of the world. But for all its industrial heritage New Lanark is a long way from being a typical "dark satanic" mill, as it marks the end of that time and the dawning of a better age. Visit the village today and you can see the big machines that kept the empire running. Enormous water wheels; later supplemented by steam engines, connected by belts and ropes to machines which turned raw cotton into usable thread and fabric. 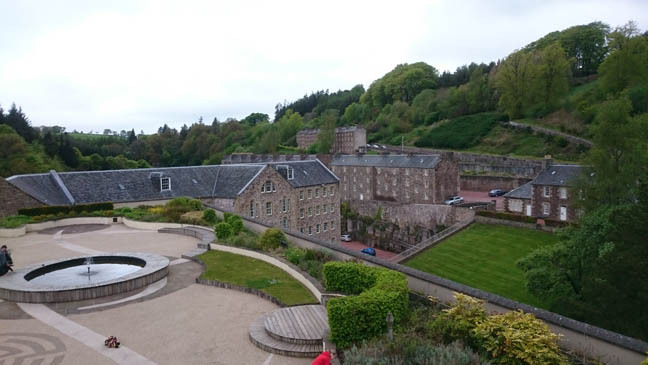 However, it’s not industrial history that is celebrated at New Lanark, rather a social revolution, and one driven by one man whose ideas created the working life as we understand it today. The man was Robert Owen, who, in 1799, bought New Lanark and immediately embarked on his "grand social experiment". His radical ideas, such as refusing to employ children, providing medical insurance, and educating the workforce, were ridiculed by his competitors who couldn't see the value in teaching children, let alone adults. But Owen believed that industry should serve the betterment of all men, not just those who owned the factories. "Eight hours daily labour is enough for any human being, and under proper arrangements sufficient to afford an ample supply of food, raiment and shelter, or the necessaries and comforts of life, and for the remainder of his time, every person is entitled to education, recreation and sleep"
Not that the workers at New Lanark did quite as well as we do; their working day ran ten and a half hours, but once mealtimes had been deducted it was approaching eight and certainly much better than the conditions in other mills around the country. In restoring the village, now a World Heritage Site, the Trust has (understandably) focused on the social revolution, but for those who want them there are big machines, and working technology, to provide a flavour of what life was like. The mill was built in 1786 and originally powered by four water wheels, themselves pushed by water collected from above the falls and channelled 300 meters in the mill lade (an open channel, also known as a headrace) which runs alongside the mills themselves. The drop is nine meters, depending on the water level, so the wheels were constructed on site and big enough to turn a building full of machinery. The open wheels were connected by belts and ropes to drive shafts running along the ceiling of each floor within the mill. The belts are long gone (something of a health-and-safety problem, even at the time women were required to wear hats following one particularly-unpleasant incident), but their paths can easily be traced through the building and the drive shafts are still in place. Water power was great, and the mill owes its location to the availability of free motive power, but open wheels aren’t perfect: when the river was too high the wheels would get locked, and when the river ran low the working shift had to be moved into the night time when more water was available. Steam engines were more consistent, and the first arrived at New Lanark in 1873. The original machines were scrapped or sold, but a fine 1911 example now sits in their stead for those who prefer their mechanisms swathed in brass. The steam engines were only used to supplement the wheels, which (after a hundred years of loyal service) were replaced with turbines. The enclosed turbines were much more efficient, and proved so effective that in 1898 spare energy was used to generate electricity with lights being fitted throughout the workers’ cottages. Lights, and power, came for free, but the switch would have to be bought: those who preferred not to pay were dependent on a central control, which would be thrown each night at lights out.